This design is perfect for the newest little one you love and has space for easy personalization. It's a quickie gift that will last a lifetime. The colors are easy to tweak for girls or boys. Just change the colors on the baby booties. Design size 3.75" x 3.75". 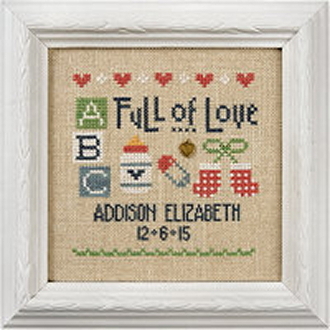 ﻿ Stitch count 54 W x 53 H.
Kit includes: 28 count Lambswool linen, antique gold heart charm and chart with instructions.